Years ago, when a majority of us were leaned back in a chair waiting for our super-fast 56k dialup internet to connect, we never considered just how huge of an effect the internet would have on the car scene. I mean sure, it was a given that it would play a pretty big role in builds just because of the ease of finding and ordering parts, but now it is so much more. The internet has helped spread styles and ideas to every corner of the globe, and has given everyone the chance of making discoveries that can change their build or taste in cars. 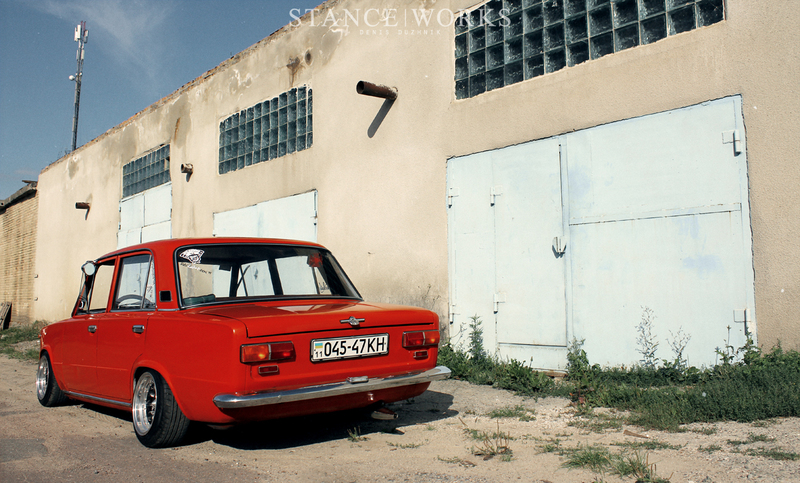 One chassis that the internet has brought to light is the Lada - the Soviet Union's reengineered Fiat 124. Ladas have found their own international following thanks to their simple and classic, albeit identical to the Fiat 124, lines and of course, how well they look just inches above the pavement. Andrey Dudnikov’s 1978 Lada 21011 is a testament to the fact that these budget-minded tin-can cars can be real head-turners with a little dedication to the chassis. For this Lada, later nicknamed “Junkie”, its story when it was just a simple daily driver that Andrey's grandfather owned. One faithful day, a plain-jane Lada was handed down to Andrey, who would spend the next few years creating a Lada that his idea of what the chassis could truly become. 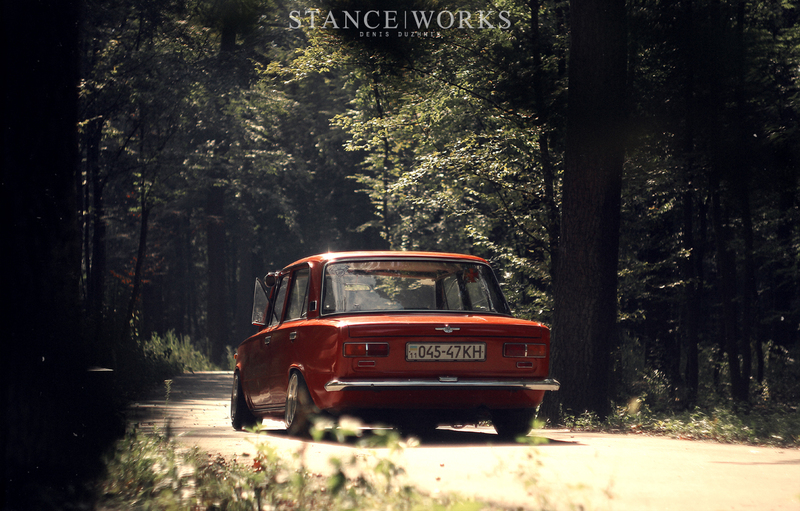 When Andrey started his journey with his Lada, the Russia was littered with two types of Ladas. On one hand, there were the boring, drab cars that were like his own, driven by grandfathers and country men. On the other hand were the "riced-out” racer wannabes from thugs and hopefuls. Neither quite fit Andrey's idea of what makes a good lada, and so he set out on his own path. 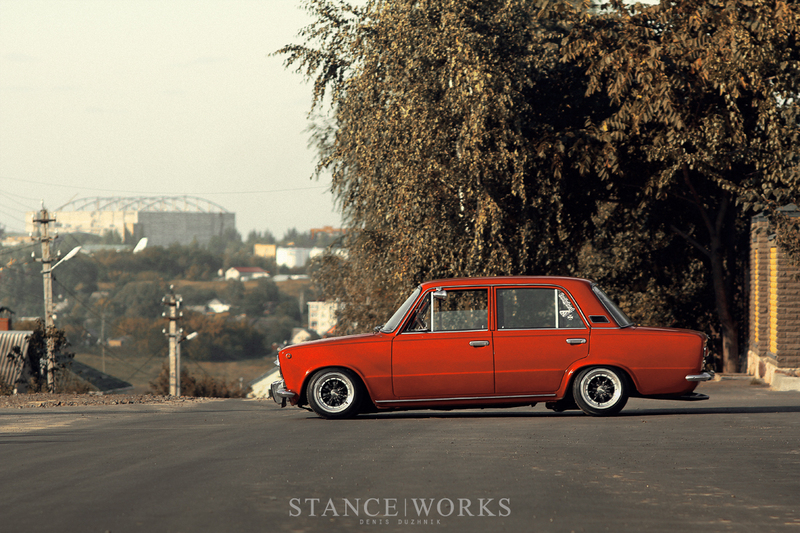 Around this time in Russia, a club called "Only Dropped" had started getting attention for their restored, lowered Ladas. This group would be Andrey’s main influence while transforming his grandfather’s Lada into a sedan that would leave people doing a double-take. Accomplishing this this feat would take so much more than slapping some wheels on and either going with bags or Coilovers but Andrey would prove to be the man for the job. As a 1978 model, Andrey first turned his attention to the wear and tear the body had endured for more than 30 years. Over the course of 2010, he replaced about fifty-percent of the body panels so that the lines of the car were free from imperfections. Hard work went in to restoring many of the original parts back to their former glory. He also put a lot of elbow grease in polishing and restoring a majority of the OEM chrome that is spread out across the body. 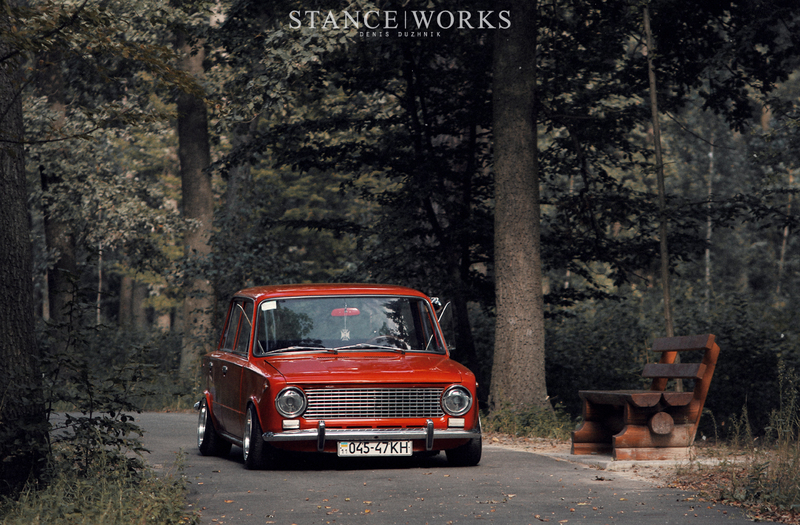 2010 would also bring Andrey his first introduction into the stance scene by way of a set of custom steelies paired with a less-than-desirable set of shocks with cut springs. Unsatisfied, Andrey tore the setup out in favor of a custom suspension setup paired with a watt's link on the rear axle. A set of MK1 VW Rabbit steelies were widened and replaced his previous set. 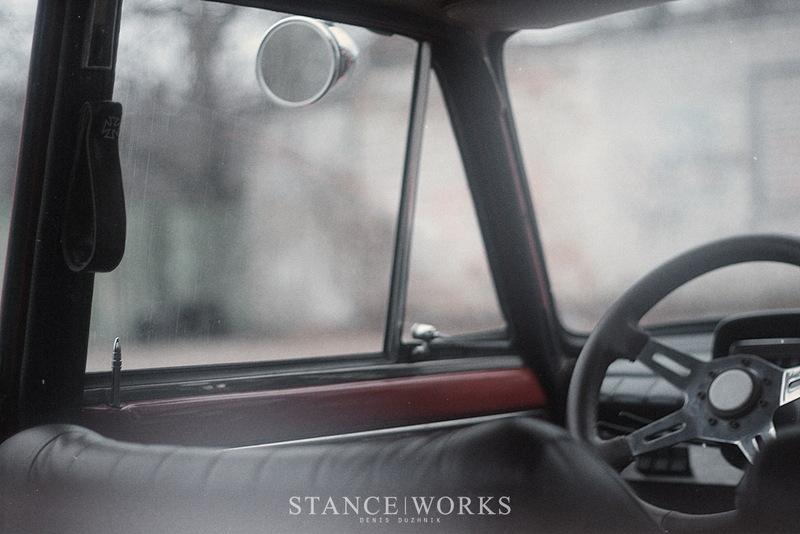 One step at a time, Andrey's Lada moved towards a finished product. However, it wasn't until just last year that Andrey took hold of the reins and truly buckled down on fulfilling his vision. Andrey revamped the interior by installing a rare Italian version of the 2012 dashboardand a fully restored O.B.A Racing Italy wheel. To make sure he was sitting comfortably in front of all that rareness, Andrey had a set of custom bucket seats built from the ground up, from the frame to the foam and then to his choice in peanut butter leather. 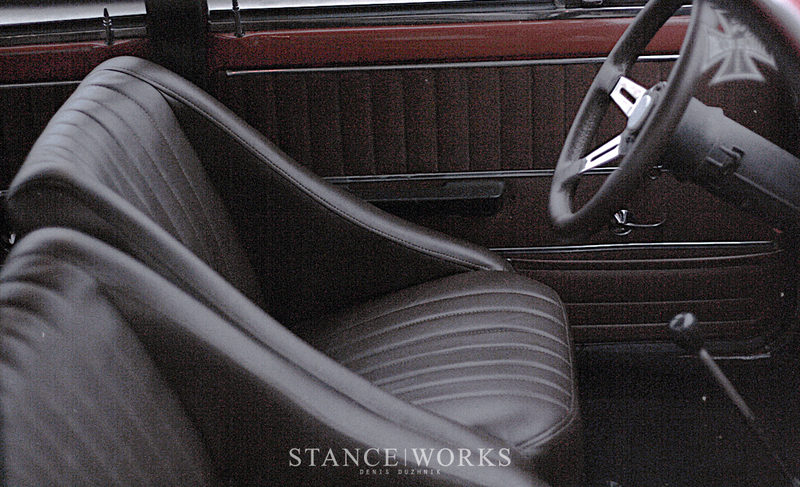 He also continued his semi-restoration with new belts and other odds and ends throughout the interior. A few OEM goodies on the outside polished the car out, but something was still lacking from the little Lada, and Andrey knew he wanted something more. Andrey took a leap that few would even consider. Where most are complacent with the solid rear axle, Andrey dropped the whole shebang in favor of an entire E21 subframe and rear end. Independent rear suspension with custom coilovers ensure that this is one of the first Ladas (if not THE first) with negative camber. Andrey finally ditched the steelies in favor of something of a similar caliber to his newly fabricated suspension. His choice this time around was a set of 13x8 Smoor Roadsters wrapped with 50/175s for rubber. There are many things that make Andrey's car special. From all the small details that he has added to the car over the years: the custom buckets, hours spent polishing chrome and most recently the custom exhaust with a vintage Soviet motor cycle muffler and vintage Triumph bullet mirror; to his unique rear-end solution and out-of-the-box thinking. Andrey’s Lada not only has a look all its own, but it’s a testament to ingenuity, and how subtlety and creativity can take a car from one of many to one of a kind. I’m very pleased to see this car on S/W pages! It adjudicates an old, old debates and shows who is who in some intelligent way. Congrats to Andrew! This Lada looks awesome! Very good job you made Andrey! 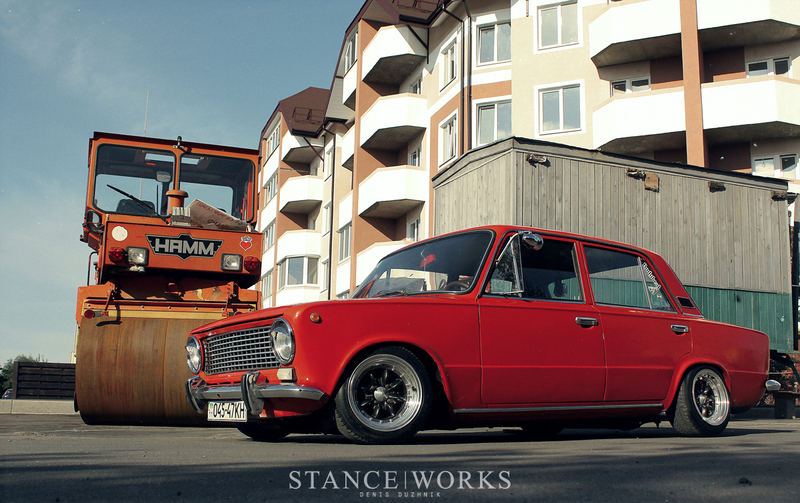 Ukraine, Romania, Moldova, Bulgaria and Russia are full of Ladas, but this one over here is the best Stanced Lada ever seen by me! not a lada fan ,but i do have to say ,that is cool ,very nice and makes you think. My father had this exact model when I was a kid. Glad to see it on SW. Always loved these things. Has anyone ever imported one to the states? гребаные тазоводы как вы достали сюда уже добрались. вы оскверняете этот ресурс своими фотками. I bought one like it for 50€, pristine and from old chap. So hope we would’ve not destroyed it in field rallying. Great looking Lada. @lolshtole Даже не думал, что тут будут люди которые восхищаются этими ведрами. Если бы это был фиат, то вопросов нет, а так как это сраный рашен автопром, то увы – х.у.е.т.а. Давай еще заниженные приоры сюда постить будем со встроенным дагом внутри. @tazigovno Про приоры я с тобой полностью согласен, но это же не приора!! Ведь приора и 2101 это совсем разные вещи! Лично я считаю так. @tazigovno @lolshtole Тролль, ты наверное пришел сюда из какой-нибудь группы вк с крутыми картиночками с сайтов из разных культур. Ты даже не знаешь историю классики, не знаешь откуда началась стенс культура и что это такое, только и можешь печатать на клаве на зарубежных сайтов, уверен ты и элементарных вещей не знаешь. Это Советский авто пром!!! Пожалуйста, не сравнивайте его с Русскими тазами!!! @stregok1 @tazigovno @lolshtole Нет парень, на SW я регулярно захожу достаточно долгое время. История классики? Мне возмутило то, что человек сравнил “таз” (в моём понимании это приора, или что-либо другое российского автопрома, без пружин) и этот проект, ведь он сравнил просто несравнимое! Историю классики? Именно этой классики? “ВАЗ” 2101 это по сути Fiat 125 (или 124, точно не помню) На сколько я знаю это практически одинаковые машины, внешние отличия лишь в бампере ( на “Фиате” он без клыков) и в ручках дверей. Не знаю что по двигателю и ходовой. От куда пошла стенс культура? На сколько мне известно она пошла от “заморских” лоурайдеров (может это и не так, не буду это утверждать) Что это такое? Стенс основан на клиренсе и положению колес в арках. Ну это так, вкратце. Не буду утверждать что я гуру стенса, но, мне кажется, элементарные вещи я знаю, если это действительно элементарные вещи. Мне вот интересно: с чего ты так уверен что я понятия не имею что и пишу? Что тебе дало эту уверенность? Вот прямо жажду с тобой дискуссировать на эту тему. StanislavAndroschuk Изначально это итальянский автопром, а советский такой же вечно ломающийся мусор как и русские тазы.